The Short Version: Indian professionals often believe they have enough time to find love. However, many are finding themselves in their mid-20s with rewarding careers but no romantic prospects in sight. There is hope, though. For more than 10 years, Jasbina Ahluwalia and her team at Intersections Match have been helping busy, successful Indian singles in the US, UK, and Canada connect with their soul mates. By using a custom, full-service matchmaking process, Jasbina gets down to what clients are really looking for in a life partner, and then she pairs them with potential matches based on shared values and life goals. If you’re seeking an effective way to meet that special someone, Intersections Match can put you on the right path. Most people don’t remember where they learned how to date. Really — think about it. Some say they’ve learned from their parents, and others from their friends and siblings. But, when it truly comes down to it, the majority of us usually just wing it. We then fumble through awkward introductions and seemingly endless first dates and wonder what we’ve done wrong when things don’t work out. Online dating has undoubtedly become one of the most popular ways to meet people, and singles aren’t just browsing and chatting. A Pew Research Center study showed that more than 65% of daters are going on dates with the people they meet online. However, that same survey found most couples hadn’t found each other on a web-based platform. While dating apps and sites can be attractive, time-saving tools, they often don’t help singles understand how to approach dating or deliver the personal touch of a professional matchmaker. 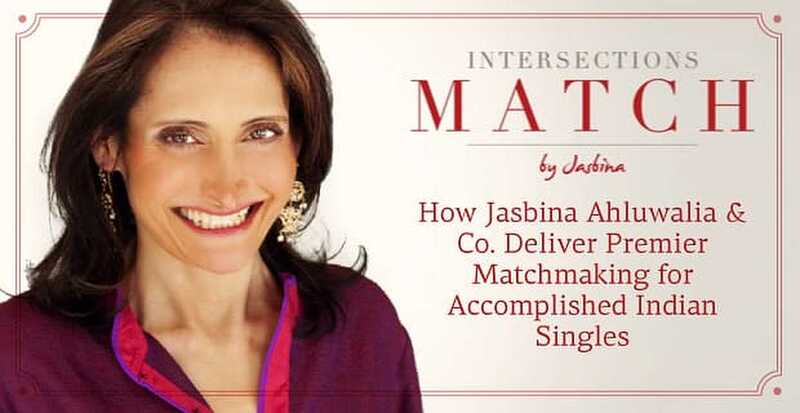 For the past decade, Jasbina Ahluwalia and her team at Intersections Match have been empowering singles, particularly those of Indian descent, in the US, Canada, and the UK to develop foolproof strategies for dating and meeting their soul mates. Jasbina Ahluwalia founded Intersections Match to help Indian singles find love in the modern world. With a host of educational and hands-on services, Jasbina and her crew of dating gurus dig deep to find what clients most want in a partner and teach them how to attract and hold on to that person. At Intersections Match, it’s all about turning first dates into fourth dates and, ultimately, into lasting, healthy relationships. Jasbina is successful in helping others find love because she herself went through a process she describes as “Don’t date, don’t date, don’t date… OK, get married!” Coming from an Indian background, in which dating is not customary, she didn’t necessarily have the skills she needed to find a partner, and she wasn’t interested in having an arranged marriage. After empowering herself to find her special someone while working as a lawyer, Jasbina thought she could help other single Indians in demanding professions do the same. She started a matchmaking company and named it after her philosophy on how life and relationships work. Since 2007, Jasbina has been fostering such intersections for professional Indian singles in their 20s through their 60s and beyond. She works with mostly highly educated, successful men and women who are seeking serious, long-term relationships. While many want relationships that culminate in marriage, Jasbina is careful to say that a race down the aisle just to check off a to-do is not what her typical client is looking for. With her personal touch and service, she gets down to the nitty-gritty of what a client is looking for and what they have to offer potential partners. At Intersections Match, clients start the process by taking an interactive and introspective 90-minute assessment. They’re able to share in-depth insights into their background, values, life, and relationship goals. Jasbina takes this information and develops a Find Love Plan customized to client specifications. This plan will include at least one, but potentially a combination, of Jasbina’s effective services. Most clients specifically seek out the Intersections Match team’s professional matchmaking. This highly personalized service selects candidates who best match the personal tastes, values, life goals, and preferences of a client. Jasbina and her team do all the legwork of searching, screening, and scheduling personal, one-on-one introductions. Alternatively, other clients benefit from Jasbina and her team’s online dating support and strategies. Here, Intersections Match guides singles to effectively navigate the waters of online dating as well as provides done-for-you services, hand-holding, and coaching — so they spend less time on the time-consuming hassles of online dating and more time with worthy potential mates. Jasbina knows of the pitfalls often associated with online dating and works with clients to build bridges to avoid these barriers and attract the people right for them. The team helps daters with their all-important pictures, profiles, and communications so they can communicate desires while accentuating what they bring to the table. Intersection Match’s dating and relationship coaching is integral to the process as everyone can use help identifying blind spots that may be stopping them from finding a great partner. For Jasbina, the most important aspect of her approach is delivering services that speak directly to the needs of the individual. There are no better words to describe the resources Intersections Match provides than those that come from clients. These individuals have been through the process and communicate how integral Jasbina has been in not only helping them find partners but also learning more about themselves. An investor out of Los Angeles wrote a testimonial that shows women and men that, with the right partner, they don’t need to give up their other dreams, whether it be a career or anything else. With Jasbina’s help, the following client’s outlook on dating and life changed for the better. Another physician, this time from Houston, was sure to point out all the ways Intersections Match helped her be more successful in the dating game. And the best news from this client? She’s now married! Although many of the connections Jasbina helps foster result in matrimony, she said she doesn’t just coach people to rush into any marriage. Rather, her goal is to empower her clients to form healthy, lasting relationships that add joy to their lives. By reading through the numerous client testimonials, you can tell Jasbina and her team have helped people bolster their self-esteem, take a more positive view of the world, and improve socially, personally, and romantically.